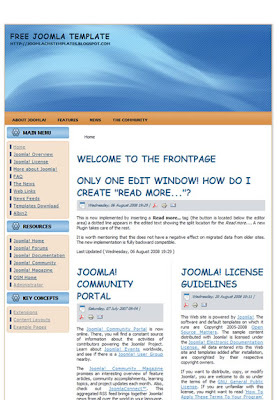 Nice three column joomla 1.5 website template is ready for download. Template has blue stripped background and nice image in the header. 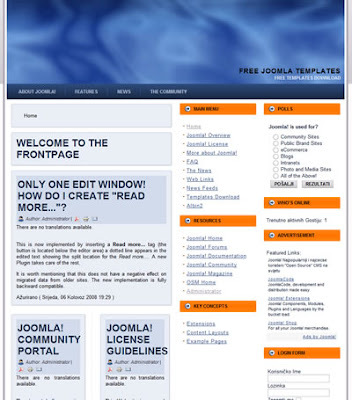 This free joomla 1.5 template can be used for various projects. 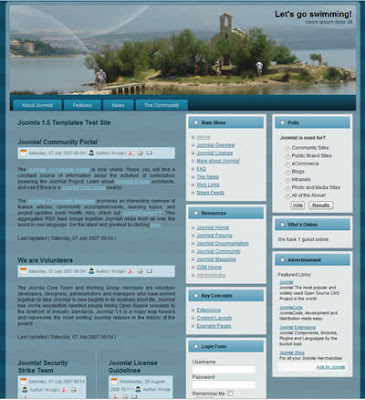 Three column Joomla 1.5 website template with image of small island with church in the header ready for download. Template has blue background and tabbed navigation bar. Main content is in the left column. 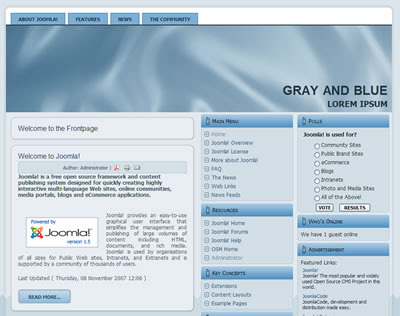 Three column Joomla 1.5 website template with gray blue color scheme available for download. Template has main content on the left and two columns on the right. Horizontal navbar is placed on the top of the header. 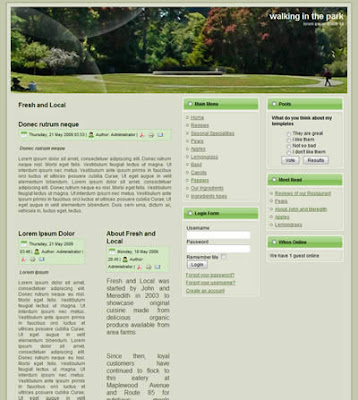 Template can be used as business website template, or for any other project. Very nice and simple two column Joomla 1.5 website template with rounded corners and navbar on the top of the header available for download. There is a very nice image in the header that can be easily replaced with some other image. Template has main content in the right column and sidebar is on the left. Nice and simple three column joomla 1.5 business website template available for download. 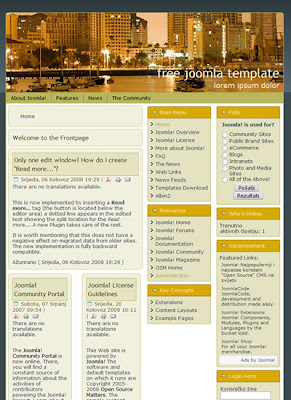 Nice three column joomla 1.5 template ready for download. Template has navbar on the top of the header, white background and yellow blue white color scheme. 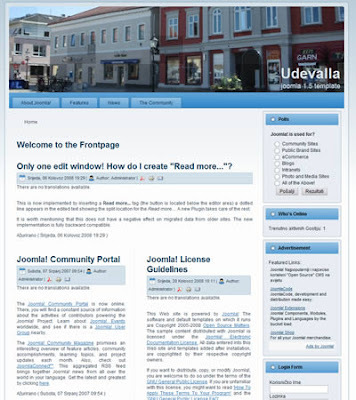 Simple two column joomla 1.5 cms website template with image of main square of Swedish town of Udevalla in the header available for download today. This is two column template with main content in the left column and sidebar on the right. 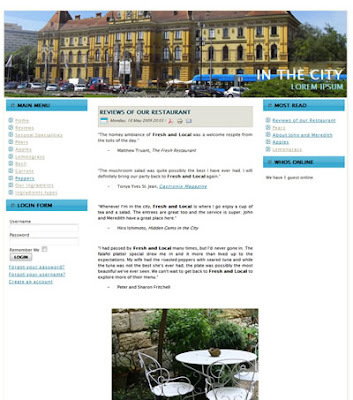 Template has horizontal tabbed navigation bar under the header, rounded corners and blue - white gradient background. I took this image of Udevalla last summer on my vacation in Sweden and Norway. 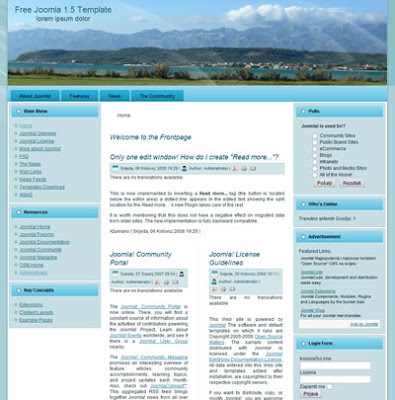 I hope someone will find use for this two column joomla 1.5 website template. Here is another Joomla website template that is ready for download today. This is three column template with main content in the center. 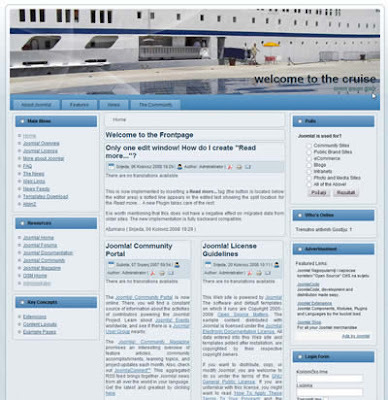 Template has image of cruise ship in the header. This shoot was taken during my last road trip to the coast. 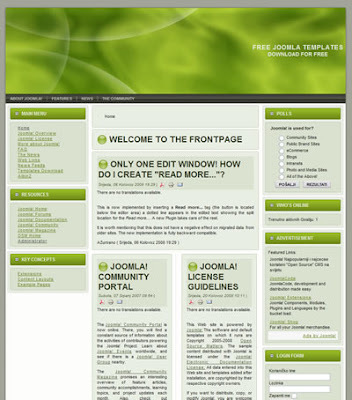 As of this morning here is three column Joomla 1.5 business website template ready for download. Template has header with image of mountain and sea that can easily be changed. Under the header is horizontal tabbed navigation. Sidebars are gray with blue undertone. Coloring is pale blue, turqoise, pidgeon gray and white. 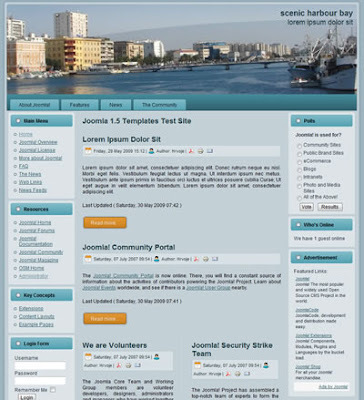 Business three column joomla 1.5 website template available for download. Template has main content in the left column and two sidebars in the right. 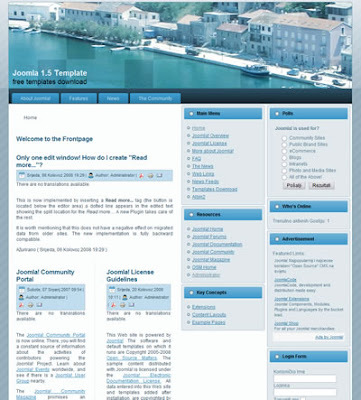 Nice two column joomla 1.5 website template with gradient blue background available for download on my blog. Template has horizontal menu bar on the top of the header, header with logo in the top left corner, two column and footer. Main content is in the left column and sidebar is on the right. Joomla 1.5 real estate website template with dark olive background ready for download. Template has threee column, header and footer. Business joomla 1.5 website template with blue header available for download. 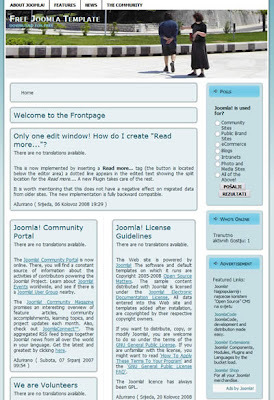 This Joomla 1.5 Template has three column with sidebars on the right side and content on the left. Logo is located in the right bottom corner of the header. Template has blue gary and orange color scheme, horizontal navbar and footer with rounded corners. Green and pebble gray joomla business template ready for download. Template has grayish stripped background and large green header. Horizontal navigation bar is under the header. Main content is in the centre column. 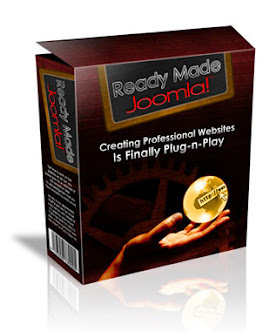 This morning I have just finished one more Joomla 1.5 template amd now it is available for download. Template has two column. Side bar is on the left. Horizontal navbar is on the top of the header. Header is red and has centered logo. This free joomla 1.5 template has nice yellow striped background. One more very simple but nice two column Joomla 1.5 business website template ready for download from this blog. 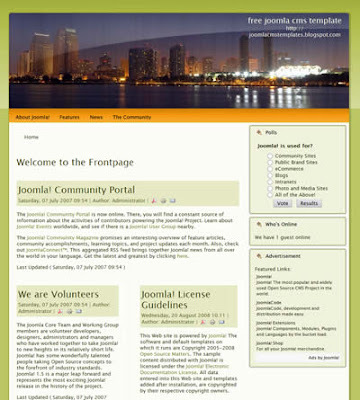 Template has large blue header with logo in the top left corner, orange tabbed horizontal navbar, and main content in the right. 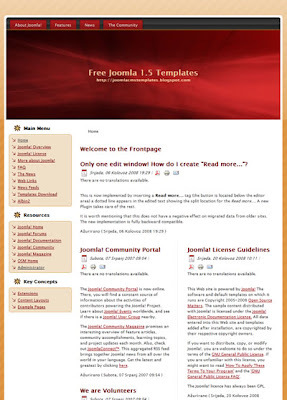 New three column joomla 1.5 website template uploaded today for you to download. Template has yellow background, header with logo on the left, main content in the left column, two more columns on the right and footer. Rounded corners free joomla template with orange horizontal navigation bar and main content in the left column is available for download. Template has green background and sidebar on the right. Logo is placed in the top right corner of the header. 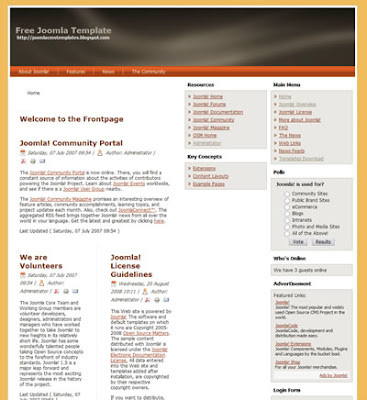 This is one very nice joomla 1.5 template with three column and gradient golden color background. 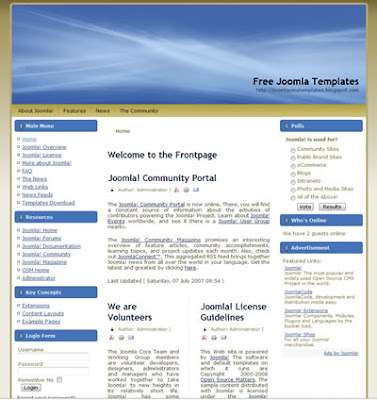 As all other joomla 1.5 templates on this blog this one is also free.